Congratulations Nina Bondre, Certified Prosthetist Orthotist! Please join us in congratulating Dankmeyer practitioner Nina Bondre - as she is now a Certified Prosthetist Orthotist! After completing her eighteen month residency program recently at Dankmeyer, Nina sat for her boards and has been waiting for her official stamp of approval. She joins the ranks of the nearly 4000 certified P&O professionals with the American Board of Certification. Sean Herrin, former Dankmeyer high school summer intern, was recently named one of the winners of the McCormick Honors 2017 Unsung Heroes award. This scholarship is awarded annually by McCormick & Company and is valued at $40,000 over four years. Sean, of Delaney High School, was one of two students selected from over 111 honorees recognized as Unsung Heroes at the event on May 1, 2017. These student-athletes represented over 65 Baltimore area schools. The program was founded in 1940 by Charles McCormick Sr to recognize athletes for unselfish team play and to highlight the efforts of those who contribute selflessly to their teams. "Sean Herrin took special pride in being a Peer Assistant on his Allied Soccer team for players with disabilities. He spent his time with the kids getting to know them as peers, while helping them achieve athletic success on the field. Herrin dedicates much of his time and energy to serving students with disabilities in other aspects of his life; he mentors disabled children in bowling, softball and ice hockey, volunteers at Kennedy Krieger’s ROAR for Autism fundraiser, and has spent three summers interning at a company that produces prosthetic limbs. Richard Reed, Herrin’s Athletic Director, said that he is “quite an amazing young man, one who truly embodies the term ‘Unsung Hero’ on the athletic field and in the game of life.” Herrin, a senior, will attend the University of Maryland Baltimore County next fall." Sean Herrin (left) pictured at the Unsung Heroes 2017 award ceremony. Dankmeyer's summer intern program is well sought after. Angie Bryl, CPO, Clinical Director, runs the annual program. Generally, the purpose of prosthetic/orthotic intern programs is to provide students early access to the profession. Angie was recently interviewed for an article in the May 2017 issue of O&P Almanac about industry efforts to provide grade school and high school students this exposure to prosthetics and orthotics. The growth of science, technology, engineering, and math (STEM) programs in many schools provides a number of students who are interested in STEM related professional explorations. According to the article, more than 90% of millennials like using their professional skills to benefit a good cause. O&P offers an environment that embraces technology combined with patient care. As part of Dankmeyer’s intern program, Sean would have shadowed staff, received hands-on training in the fabrication of devices, conversed with patients, and gained general knowledge about O&P. Additionally, as the students learn from O&P professionals, the pros can learn from the students. As Angie says in the article, “We can get stuck in our ways at times, and students often bring fresh ideas… They bring other things that they learned in the classroom or from their experiences to our work.” Both intern and professional stand to benefit from the exchanges that occur in these programs. As Sean prepares to graduate from high school, we will also be preparing to welcome a new batch of summer interns. We are so happy for Sean and this well deserved honor and wish him the best of luck as he continues his education! If you would like to know more about learning experiences with Dankmeyer, send an email to info@dankmeyer.com. We are so happy to congratulate Kristen Beltran, who has completed her Residency in Prosthetics and Orthotics at Dankmeyer, Inc. Kristen is now Board Eligible - and that means time to take some tests! Originally from Kalamazoo, MI, Kristen joined the Dankmeyer team in 2015 to do her double residency. She received a BS in Therapeutic Recreation with a Mathematics minor from Grand Valley State University, followed by her Master’s in Prosthetics and Orthotics from Northwestern University. Kristen first became interested in prosthetics and orthotics in high school, where she had a soccer coach who wore a prosthetic leg. She has worked with adaptive sports and recreation programs over the years. Since coming to Dankmeyer, she has participated for the last two years in a local middle school 3D E-Nable project, providing resources for middle schoolers in the STEM program to learn about prosthetics and orthotics and the use of 3D technology. Moxie was first introduced to Dankmeyer in November of 2016, when she was seven months old and christened “Autumn” by her rescuers. 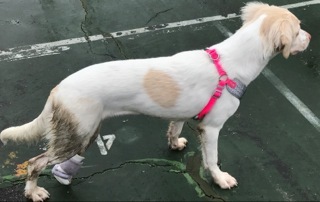 When found, this little English Setter mix was missing her left hind leg below the knee. They approached Dankmeyer, Inc. about making her a prosthesis, and during that evaluation process, the pup was adopted by Dankmeyer staff member Jeanne Smith and her family. She was renamed Moxie after Jeanne asked fellow Dankmeyer staff to make suggestions in a naming contest. "Moxie" was the winner - meaning courage, determination, energy, and pep - and all those words describe this little bundle of fun! Since then, the Dankmeyer team, headed by Jed Newhardt, CPO, have been collaborating, creating and trialling different prosthetic designs in order to find the best fit for Moxie. The process takes time and patience; monitoring her day to day, taking her out in the community and parks for walks and runs to check the functionality, fit and comfort; then taking those results and tweaking and redesigning and refitting. Moxie is adapting well to the challenges during this process. Soon she will be modelling her new high fashion leopard print designed prosthesis. She is now learning to jump up in efforts to teach her balance and support when outside in the community. She has now mastered, with her newfound confidence, descending the stairs without sliding on her belly! As her confidence and strength grow, so does her love for meeting and making new friends. Moxie is a true joy and inspiration to all who come in contact with her. Here is a video of Moxie playing with her family, testing a prosthesis.